Ever wished to have got the powerful Sense UI from HTC Hero on your Motorola Droid? 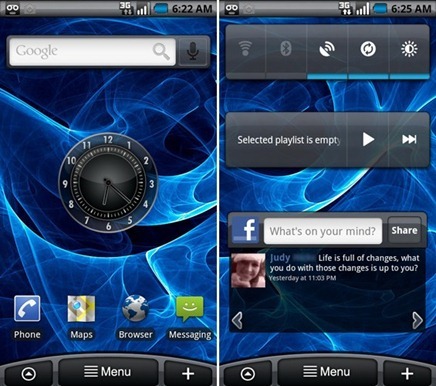 Droid, which ships with Android 2.0 has got the plain and simple interface which comes as stock from Android 2.0 OS. But now thanks to folks over at AllDroid, you can now get the attractive looking Sense UI like theme right on your Motorola Droid. 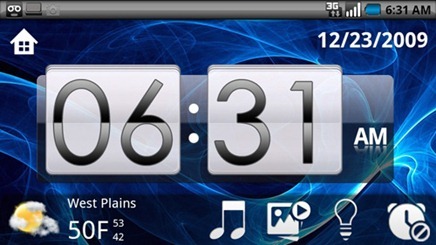 From flip clock and weather widget on the home screen, to widget based multiple screens, to skinned icons, everything has been skinned to match the look and feel of HTC Sense UI from Hero. The theme is compatible to work with MetaMorph which is available for free from Android Market. MetaMorph is basically an app to help you skin your phone without having to go into recovery mode. Follow the simple steps posted below to get Sense UI like theme on your Droid. You’ll need a rooted Droid with Android 2.0 or 2.0.1. Apparently, some have also got it to work with the leaked Android 2.1 ROM for Motorola Droid. Follow the guide posted here to Root your Droid on Android 2.0.1 if you haven’t already. Step 1: Get MetaMorph which is available for free from Android Market. 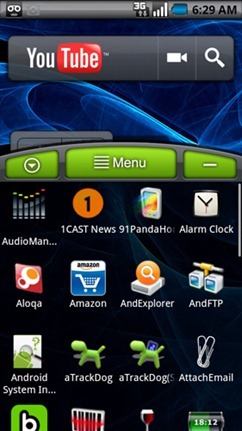 Step 2: Download HTC Hero Sense UI like theme for your Droid. Step 3: Move the downloaded files into "AndroidThemes" folder found in /sdcard on your Droid phone. Step 4: Start MetaMorph, navigate to the folder where you have copied the file and select the theme. Step 5: Touch “OK”, followed by “Apply All” to apply all the .apk files in the theme package. NOTE: If you are using Android 2.1 on your Droid, MetaMorph might tell you multiple times during installation that it is skipping certain files. This is normal and a known issue. Just ignore these prompts as the theme regardless of this. That’s about it! You should now have the gorgeous looking Sense UI like theme on your Droid. Feel free to ask me any question regarding any problem that you may encounter when installing this theme. No way near UI Sense, I must say. I'm running into two issues: 1. I can't find the “AndroidThemes” folder on my SDcard. I created one manually but am not sure if it will work. 2. When I try to run MetaMorph, it throws an error “some files could not be extracted and set up. Please make sure you have enough free space in /system and that BusyBox is installed”. I clearly have enough space so space isn't the issue. It sounds to me like a permissions issue where it isn't able to write to the /system folder even though my phone has been rooted. Also, I have no idea what it is referring to with BusyBox. When I laund MetaMorph, I get the error saying “It does not look like your phone has root acces! The file: su could not be found” How do I get root access? how do you revert back to the original theme?